Biobanking of cell lines, microbial strains, and other biological reagents generated through scientific investigation with a biological resource center (BRC) ensures they will be accessible to support future scientific endeavors. ATCC provides biobanking services such as material authentication, production, preservation, and secure distribution of biological materials for members of the research community. ATCC propagates material it receives under optimal growth conditions and prepares a master cell bank of low-passage, authenticated cultures from which distribution stock can be derived. 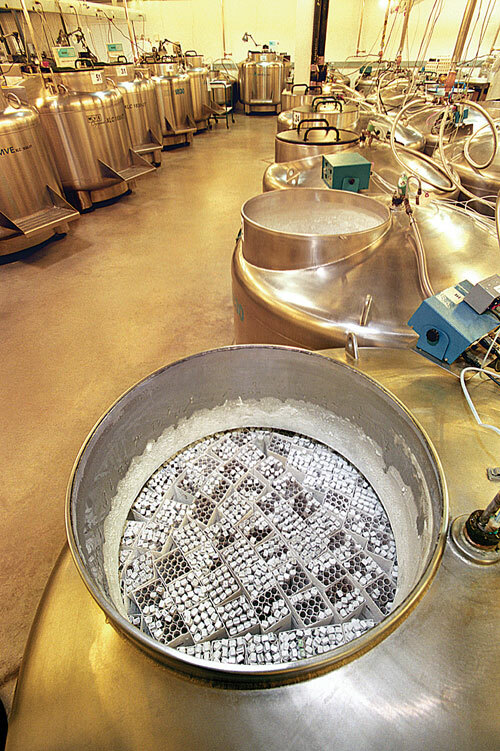 Many microbial cultures and derivatives are freeze-dried to allow for low-cost shipping and convenient storage by end-users. Cellular cultures are frozen in the log-phase of growth in a cryoprotectant, such as dimethylsulfoxide, using a slow cooling rate, generally -1°C per minute. These practices preserve viability while mitigating culture damage or cellular apoptosis due to osmotic imbalance or the intracellular formation of ice. Newly acquired cell lines are tested for mycoplasma, fungi, bacteria, and virus contamination, and assayed to authenticate cell line identity. ATCC utilizes a multistep process to confirm the identity of a cell line that includes confirming the species of origin with PCR to detect species-specific variants of the cytochrome C oxidase I gene and state-of-the-art short tandem repeat (STR) profiling to distinguish between individual human cell lines. STR profiling is a PCR-based technique that takes advantage of informative variability in the number of tandem repeats that reside in the microsatellite regions of the DNA. The STR method provides a genetic profile that can be compared to known standards within the ATCC and in the future to NCBI reference databases. It is standard practice at ATCC to compare the STR profile of new production stock of human cell lines against the baseline profile of the original deposit, thus confirming the identity of every distributed vial of a particular human cell line. Together these approaches allow for the complete validation of both new and established cell lines in the ATCC collection. Similarly, ATCC ensures the viability, purity, and taxonomic identification of existing microbial strains and new acquisitions in the collection using a polyphasic approach that compares both phenotypic and genotypic traits to reference standards. Microbial characterization services performed by ATCC include purity assessment using general and selective media, genotypic analysis of conserved genetic elements (i.e., 16S rRNA gene for bacteria), and phenotypic analysis using traditional and automated biochemical profiling platforms from Biolog and bioMérieux. The ATCC general collection depends on contributions of investigators from around the world and features well-characterized cell lines and microbial cultures often supported by peer-reviewed publications. All materials deposited with ATCC are authenticated and tested to ensure that the genotypic, phenotypic, and functional characteristics of the original deposit are maintained. The depositor has the option to allow ATCC to distribute the materials for research or commercial use. ATCC also provides safe deposit services designed to meet the needs of government, academic, and industrial laboratories, as well as materials undergoing the patenting process. The depositor retains all rights to their cultures, and information regarding the deposited material is held in strict confidence. Materials are not available to third parties without the expressed written permission of the original depositor, and the depositor may request that materials be released for distribution or destroyed at any time. For proprietary materials, ATCC offers services that are in full compliance with current good manufacturing practices (cGMP). The cGMP safe deposit services include all the benefits of our general and patent deposit services, plus the following features designed to maintain compliance with cGMP: cGMP dedicated and validated liquid nitrogen tanks accessible only to cGMP-trained staff with quality assurance (QA) oversight, tracking labels to ensure that cGMP materials are segregated upon arrival at ATCC, QA supervision of all freezer entry and retrieval activities, and specially trained employees to perform all cGMP duties. ATCC has storage facilities designed to accommodate the individual needs of all specimens. Additionally, all facilities have fully equipped monitoring systems and 24-hour surveillance to ensure the safety of the deposited material. Together, the facilities and staff at ATCC create a safe and secure environment for general, patent, and cGMP deposited materials. The biomaterials produced through scientific inquiry are often valuable assets that support important scientific breakthroughs. To secure and build on these findings, biomaterials must be biobanked to protect them against loss or contamination, so they can be shared with the research community. ATCC has storage facilities designed to accomodate the individual needs of all specimens. Carolyn Peluso, Ph.D. (cpeluso@atcc.org), is a cell biology specialist, and Cara Wilder, Ph.D, (cwilder@atcc.org), is a microbiology specialist at ATCC. specialist at ATCC. Web: www.atcc.